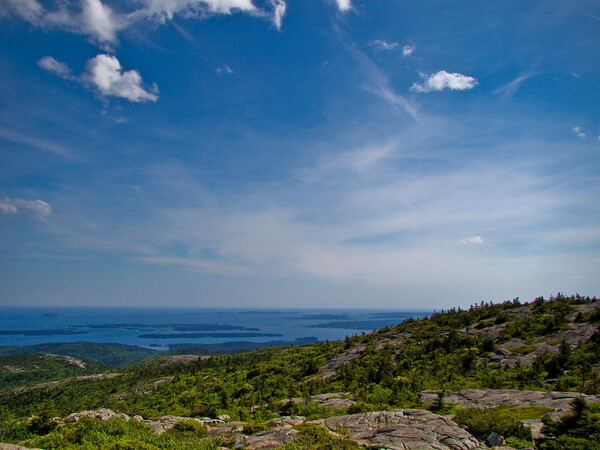 On a good day on Cadillac the views in every direction are astounding. Though the clouds over the Atlantic were of a different kind and a different quality than those over the landmass, they are no less beautiful, and the Cranberry Isles, dotting the mid-ground before the Atlantic shades off into the horizon make for an interesting vista. This is another shot I have taken on every trip, and another shot that is never the same twice. Sony DSC H50 at about 40mm equivalent. F5.6 @ 1/250th @ ISO 100. Programed auto. In Lightroom, Recovery for the sky and clouds, added Clarity and Vibrance and the Landscape sharpen preset. Because I wanted the foreground to pop, I used a graduated filter effect from the bottom up two thirds, and added Exposure, Clarity, and just a touch of Contrast. Steve- A beautiful, sunny Maine image.